Over the years I have ceded my living room more times than C P and Berar has been ceded in the annals of Indian history! I began realising that I knew nothing whatever of child rearing. I had been screwing up their lives, no less. 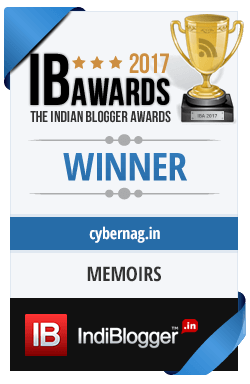 A note of thanks to my friends and readers on the eve of the third blogaversary of the Cybernag. The L&M saw how hassled I was and decided to pitch in with other things without being told — like cleaning the house. I made the tactical blunder of telling him not ask me where to put what and use his discretion while doing it.